Success is synonymous with struggle and sacrifice. One cannot simply attain the goal of his or her life without struggle and sacrifice. And with these two traits, one can then become a Muhammad Ali, a Michael Jordan, or a Michael Gates. From Aristotle and Christopher Columbus to Abraham Lincoln and Albert Einstein, and from Thomas Edison and Martin Luther King, Jr. to Mandela and Mother Theresa all have one major thing in common. They have made use of these necessary tools of struggle and sacrifice. Even the Prophets of God, and other saints, are not exception to these basic rules. Prophet Nuh (Noah) for instance, struggled and sacrificed for more than 1000 years. The struggle of Prophet Abraham almost cost him his life when he was thrown into the fire pit. He also almost slaughtered his son for the sake of his goal. As a result of all his sacrifices and constant struggle, he achieved the friendship of God, and became a Patriarch of the family of Prophets. Prophet Moses, Prophet Jesus, and all the other Prophets paid their costly prices in the way and name of God. The Prophet Muhammad, gave one of the highest sacrifice and attained a high rank in the eyes of God. All their gains were proportioned according to their sacrifices. 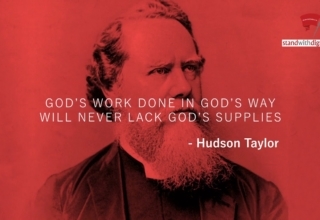 Sacrifices could be of multitude of things and conditions. According to the Quran, sacrifices, both physical and mental anguish, may consist of such things as thirst, hunger, loss of worldly possessions, and of friends and family, and even with one’s own life. With due respect to all these high ranking people and Prophets, all will come under the category of ‘all sacrifice some’. Of course, ‘some’ sometimes will include a whole lot – beyond one’s imagination but they still do not fit in the category of ‘some sacrifice all’. In the events of the world, there is only one person and the only one that we can find in the history of mankind, who appropriately comes under the category of ‘some sacrifice all’. And that will be Imam Husain, the grandson of Prophet Muhammad. His sacrifices are incomprehensible. He left the serene surroundings of Medina, his hometown, made to leave only a few friends and family behind. He had to abandon a required practice of his religion, the Hajj (pilgrimage). He then was forced to travel in the arid climate of Arabia along with the majority of his family and friends. He was denied access to Kufa where he was requested to come by his followers. He was forced to camp in a segregated piece of land away from any civilization, called Karbala, Iraq. He was denied the basic necessities of life including water and food, which is the basic right of every living creature anywhere especially in the devastating heat of Arabia. Eventually he was besieged and murdered along with his family and friends, from an 80-year gentleman to a six-month-old infant. 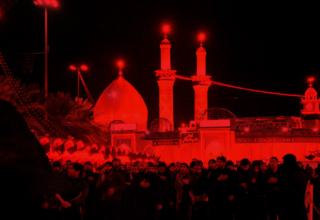 Imam Husain’s ‘army’ consisted of about 72 devoted friends and family. This troop of men stood up against a giant and intimidating force of at least 30,000 strong army of Yazid, the tyrant. The rest of his family consisting of mainly ladies and children were first forced to watch the killings of their fathers, brother and sons in plain sight. And then to further add insult to injury, witnessed to motionless bodies of their dear ones as they laid in the hot sun, being heartlessly trampled by horses, and finally beheaded. After that, Yazid’s army continued with their atrocities by setting the camps of Imam Husain on fire, and all were held captives and taken in this difficult condition forcefully from Karbala to Kufa, and then finally from Kufa to Syria. Their trip of hardships and anguish, ended in the court of the most disgusting and offensive oppressor Caliph Yazid. They were kept imprisoned for more than a year in the most deplorable conditions. They were eventually released after the worst humiliations and maximum torture. 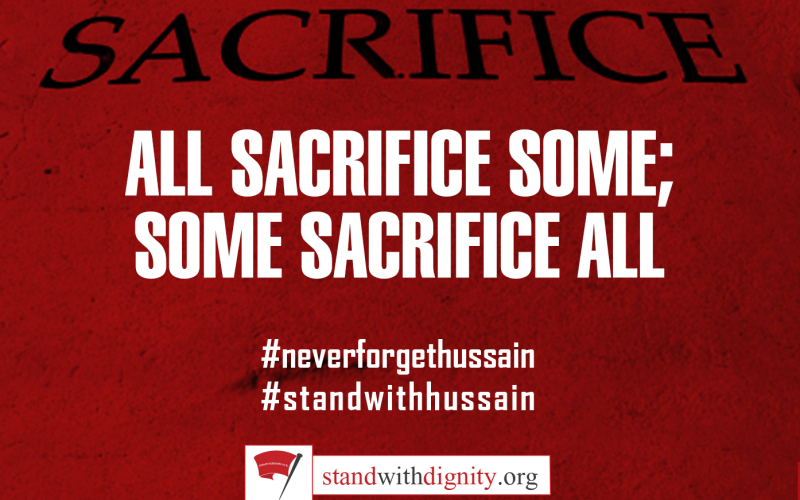 Any fair-minded person will notice that Imam Husain sacrificed all that he possessed and much more. The natural question that arises is why did the grandson of the last Prophet of Islam, sacrificed everything? What were the motives, reasons, and objectives behind his steps? And then finally, did he achieve his objectives and target, or were his sacrifices wasted? Imam Husain was not an ordinary person. He was the son of Imam Ali and Fatima(s), the daughter of Prophet Muhammad, and grandson of Prophet Muhammad. Both authentic Shia and Sunni statements declare he was an Imam, a leader of the community, even while he was a child. His sanctity, piety and truthfulness, was proven by the verses of the Quran (3:61and 33:33). Why then did he give such a massive sacrifice? The reasons can be traced back to the time of Prophet Muhammad and beyond. At the time of the declaration of the Prophet Hood of Prophet Muhammad, the human beings were at the lowest ebb of humanity. There were no trace of human dignity left, what to say of human freedom and rights? Might was right. This rule of the jungle, was the reigning order of the land. Allah declares in the Quran that He has created human beings as free people. They have a right to free thinking, free choice, free to speak their hearts and minds, and act accordingly. We all have inborn-engraved in our genes, the freedom and common sense of judging good from bad, right from wrong. Every individual has certain rights and some obligations. Prophet Muhammad worked hard to bring this dignity back to the human beings. He brought the human race back to that level of self-respect, dignity and piety regardless of color of skin, family trees or status. Unfortunately, within 50 years of the Prophet’s death, the human beings were brought back to square one. They were degraded. Their freedom was snatched to the extent that Yazid the son of Muawiyah was manipulated to the throne, and was called the Caliph of Islam. As if such degradation were not enough for humanity to be ruled by such an inept person, the first action that Yazid initiated upon taking over the seat of government, was to write a strict letter to the Governor of Median. 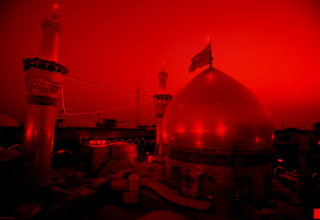 Yazid commanded him to immediately obtain an oath of allegiance from Imam Husain to him, the new Caliph (viz. a complete sell-out). The Governor was told to respond immediately with either the allegiance of the Imam or his head. It is unimaginable today that in such a vast and mighty reign of millions of people, only four were around to defy Yazid and his illegal take-over of the Caliph. Rather, more unthinkable is the fact that with his immense power and might, Yazid could not sit tight and rest until and unless Imam Husain accepted him as the new Caliph and bow his head to him. In the US Constitution, the single most important Bill of Right is the Freedom of Speech. Imam Husain more than 1400 years ago, stood up for this human rights of freedom of speech, thought and action, within acceptable norms. It was a fight of evil power and rule of jungle against the basic rights and dignity. 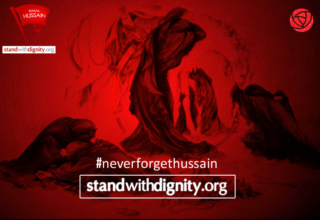 Imam Husain refused to bow his head to this tyrant and instead stood for the human dignity and basic human rights. 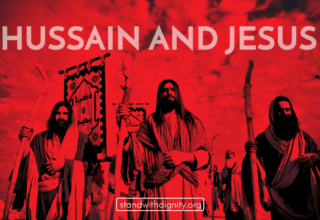 Imam Husain not only stood firm in his resolve, he openly defied Yazid, and showed the world the correct way of standing to atrocities and injustice. This infuriated Yazid, like an elephant gone wild. 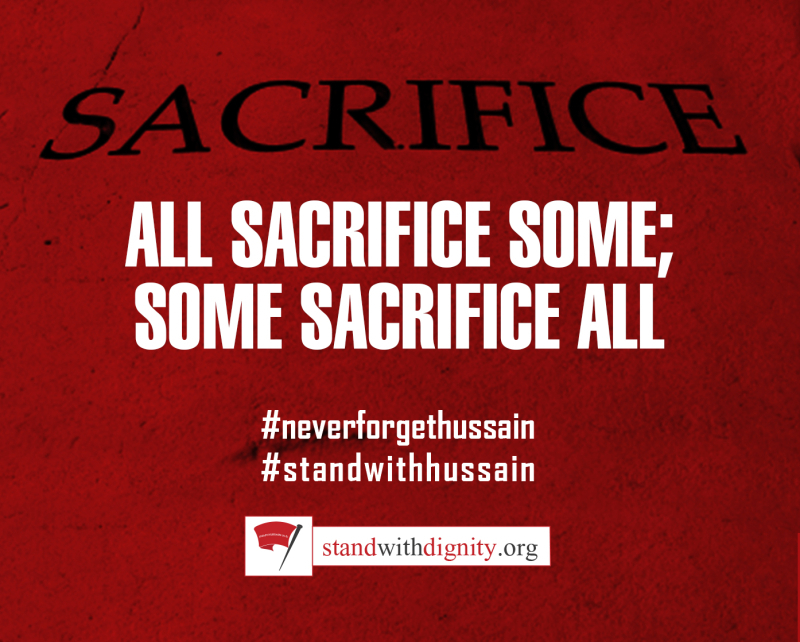 Imam Husain beyond all odds, remained steadfast in his beliefs and ideals, though in that process he had to sacrifice everything that he had and more. Today after 14 centuries, we can clearly see who was right and who was wrong. Today the entire world is humming with the sounds of human rights and freedom. Today everyone is gallantly facing atrocities, injustices and acts of violence, so that others may live in peace tomorrow. Today we can judge between the shameful defeats of Yazid with the resounding success of Imam Husain. Today, almost anywhere in the world, there is the basic favor that the Lord endowed on all people from birth, and that is the simple freedom of speech and action while longing for hope, peace and justice. It is the freedom for the heart, mind, and soul to speak out without fear and, the freedom of thought and human dignity. And these freedom due to the struggles of the sacrifices of Imam Husain, were kept intact for us to enjoy today. That is why Imam Husain sacrificed all, and this success of the distant past looks so enticing to all the freedom loving people of the world. That is why, for the last 1400 years, people who have the power of knowledge, eye to search and wisdom to ponder, commemorate and rekindle this great struggle and sacrifice, year after year. O’ my son make yourself the measure (for dealings) between you and others. Thus you like for others what you like for yourself and hate for others what you hate for yourself. Do not oppress as you do not like to be oppressed. Do good to others as you like good to be done to you. Regard bad for yourself whatever you regard bad in others. Accept that (treatment) from others which you like others to accept from you. Do not talk about what you do not know even though what you know be very little. Do not say to others what you do not like to be said to you.